Site is not active, please see our recommended options. – Offering wide range of available banking methods to choose from, led by Bitcoin and Litecoin. While they aren’t using Provably Fair technology which is a standard for Bitcoin and Litecoin casinos, Winvery has implemented Industry Standard RNG for fairness and it servers them well. Deposits and withdrawals are secure thanks to the implementation of firewall protocols, server-side and SSL encryption for incoming and outgoing transactions with users. Winvery Casino is sure to impress at first sight. The design is simplistic yet elegant and unlike many other Bitcoin casinos has decent animations and can take quite a while to load. This is all for the best though, for the experience is enriched by sleek menus and excellent looking games that are sure to entice new and veteran players alike. The software handling the poker and casino titles is made in-house, specifically for the purposes of Winvery Casino. It boasts varied and quite authentic visual presentation of the titles that are up on offer, with sounds and alerts being fully supported and realized. One minor negative detail is the constant pop-up of games once you open the casino in another tab, which can be quite boring if you are constantly switching between tabs on your browser. The whole casino experience is unhindered, thanks to flawless optimization of both the games and the entire log-in / out, depositing / withdrawal process. As mentioned earlier, players have the option to opt for one of the 12 supported languages at Winvery Casino, including English, Russian, Italian, Chinese, Greek, Spanish, etc. What other casinos can make a boring and rather complex process, Winvery Casino solves in just a manner of seconds. You can set up your free casino account just by providing the necessary information like username, password, first and last name, along with a valid email address, and you’re set! While the casino supports several methods for making a deposit, it is worth mentioning that in order to be eligible to start playing for real you will need to make a minimum deposit of 10 mBTC. What separates the casino titles from the ones seen at the competition is the accent to detail – everything looks and sounds authentic, with unique voices and sound effects for the card shuffling, chips placement and more. The customer support team at Winvery Casino can be reached through their dedicated email service on the official website. They have a client that can be linked to the most popular email providers which is a nice touch. 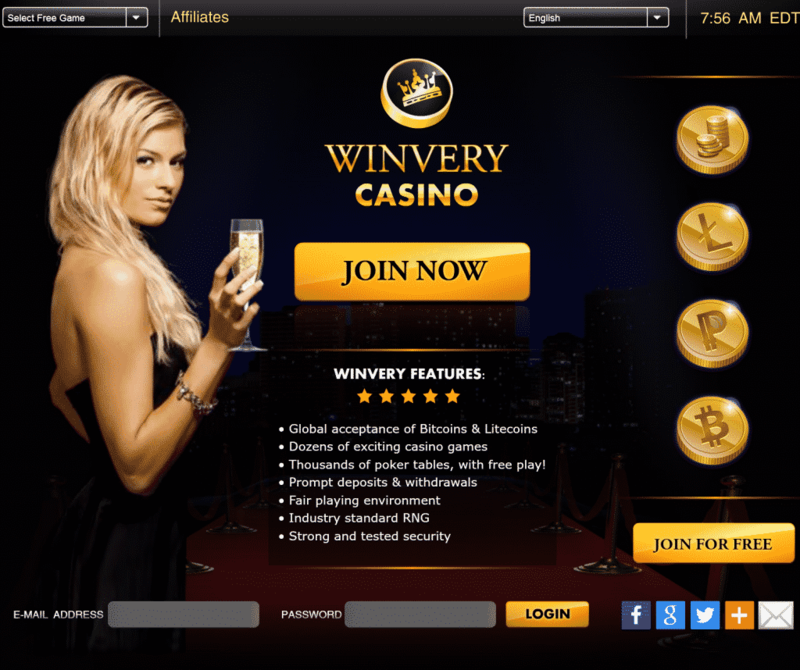 For those active on the social networks, Winvery Casino can be reached via Facebook or Twitter. The site support is prompt to answer questions and resolve issues within 24 hours after an email was sent to them. Winvery Casino is using the latest in casino security including 128-bit SSL encryption and cold storage for their Bitcoins, meaning your transactions will be both fast and safe. While there is an absence of Provably Fair, the site does employ a trusted and certified RNG system which provides enough evidence that there is no foul play at the casino. The primary transaction methods at Winvery Casino are the Bitcoin and Litecoin online crypto-currencies, which require a valid address and an account to be used effectively. Players however, have the option to opt for more traditional banking methods, like Visa, Ukash and Western Union. Winvery Casino has a lot of things done right – starting from the game offer, excellent language support, overall look and performance of the software and security. They also added additional deposit options for players who do not have a Bitcoin or Litecoin wallet. Overall, the experience enabled there is a positive one.